The South Dakota antelope is the more common name for the pronghorn that roam the open grassland. The buck’s horns are up to 15 inches long and have the distinctive prong on the front which gives the species it name. South Dakota antelope are also known as pronghorns. Mainly reddish brown, the white underneath and on their necks provides distinctive markings. The hair on their rumps is raised when they are startled and provides a white patch that is visible for long distances in the open prairie. South Dakota antelope are about three feet tall at the shoulders, and weigh about 75-125 pounds. As the fastest land animal in North America, the South Dakota antelope can run 60 mph for great distances. The speed and endurance is their defense against predators such as coyotes and mountain lions. A two-day-old fawn can outrun a man and at four days can out sprint a horse. Pronghorns wander in herds on the open grassy areas. 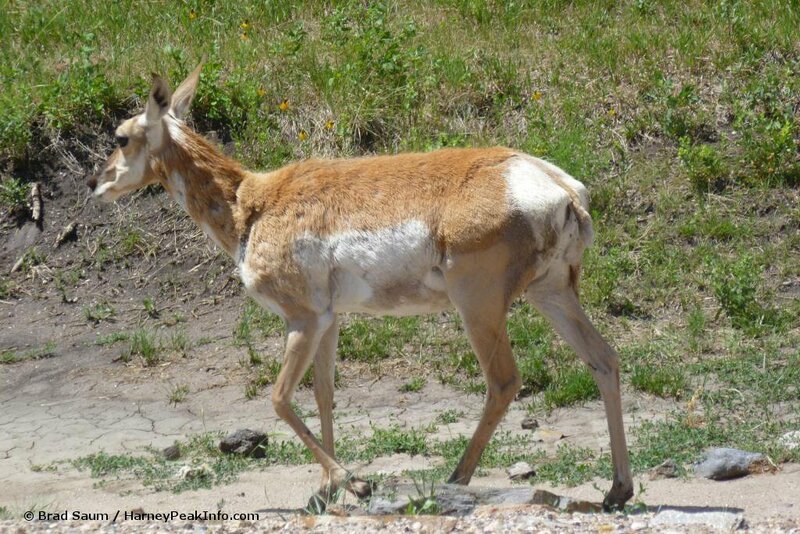 Pronghorns wander up to 10 miles (16 kilometers) a day in search of food and water. During the winter months, they dig down through the snow and eat the grasses hidden underneath. When water is scarce, they get the moisture they need by eating cactus plants which hold a great deal of water. The South Dakota antelope can frequently be seen along the Wildlife Loop Road in Custer State Park, which presents ideal grasslands habitat.